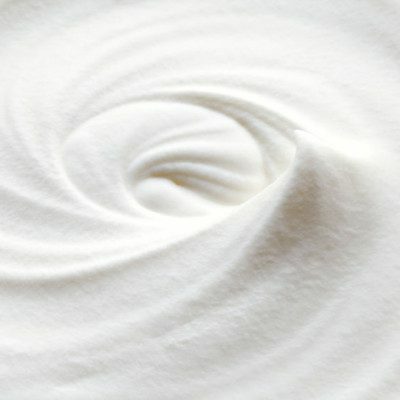 Cream is a rich, thick emulsion of dairy fat available commercially as a white or light yellow colored fluid or it can be whipped into a stable foam for various applications. As far back as 9000 B.C., humans have been breeding animals for milk production. Cream is a dairy product, derived from the milk of cattle or goats. When fresh milk is left unhomogenized, the cream naturally rises to the top due to the lower density (specific gravity) of fat globules. It is then easily skimmed off the top and used for butter, sour cream, or whipping cream. Some dairy companies add polysorbate to the formula to increase whipping and stability without the addition of stabilizers. Cream is the fatty liquid that forms a layer on the top of milk prior to homogenization. A process of continuous centrifugation separates cream. The centrifugal force causes natural separation of the fat globules from the milk serum.1 The separated cream is then homogenized and pasteurized or ultra-pasteurized. When pasteurized, better flavor can develop and the cream whips up with greater fluff. Ultra-pasteurized versions offer an extended shelf life. It has a cooked flavor and is more sensitive to whipping, therefore it is not ideal for recipes that require peaks or frothing. As an ingredient in many foods such as ice creams, cakes, sauces, puddings, etc. As a topping in many cakes, pancakes, milkshakes, hot chocolate, fruits, etc. It also finds applications in hot beverages such as tea, coffee, etc. FDA states that cream must contain at least 18% milkfat, and it should be pasteurized to remove any harmful pathogens. The FDA provides specific guidelines for milk and cream, including pasteurization conditions under CFR § 131.3. It mandates that ultra-pasteurized cream is heated at or above 280°F (138 °C) for at least two seconds. The following table gives an account of % fat, processing steps, contents, and the FDA regulation of different types of cream. Jonas, J. J. “Utilization of dairy ingredients in other foods”. Journal of Milk and Food Technology. 36(6), 1973, pp 323-332.